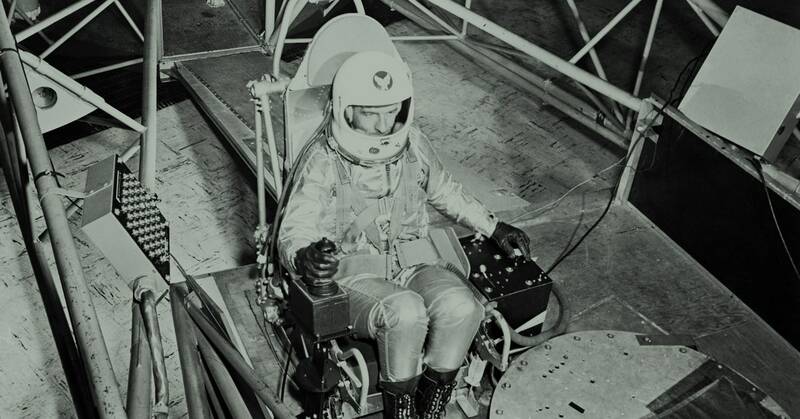 Myers was one of 11 men specifically recruited by Dr. Ashton Graybiel to help test the feasibility of human spaceflight, at a time when nobody knew whether the human body could withstand a trip beyond our atmosphere. For nearly a decade, the US Navy put 11 eleven men through countless tests. Four of the men spent 12 straight days inside a 20-foot room that rotated constantly. In another experiment, they were sent out to notoriously rough seas off the coast of Nova Scotia. On the boat, the men played cards while the researchers were so overcome with seasickness that they had to cancel the test and go home. Others were sent up in the so-called “Vomit Comet,” an aircraft designed to simulate zero gravity. That’s the test Myers is still most fond of. “This free floating was a fascinating experience,” he says. “No other tests came close as my favorites.” But Myers and the other men would never go to space. In fact, they would never be allowed. They were recruited for these tests for the exact reason they would never pass the NASA astronaut qualification exams: All 11 men were deaf. Rose Eveleth is an Ideas contributor at WIRED and the creator and host of Flash Forward, a podcast about possible (and not so possible) futures. It’s no secret that it’s incredibly difficult to become an astronaut. NASA’s selection process is notoriously rigorous—strict enough that it was the most plausible kind of place to set the movie Gattaca, where only the perfectly genetically engineered get to board rockets bound for space. Writer Tom Wolfe documented the space program’s strenuous astronaut training program in his book The Right Stuff. The assumption has long been that this training is a necessity—traveling to space is a mentally and physically grueling endeavor. We need the strongest, smartest, most adaptable among us to go. But strength comes in many forms, as do smarts. And if you want to find people who are the very best at adapting to worlds not suited for them, you’ll have the best luck looking at people with disabilities, who navigate such a world every single day. Which has led disability advocates to raise the question: What actually is the right stuff? “Crip bodies were built for space travel. Crip minds already push the outer limits,” Alice Wong, founder of the Disability Visibility Project, tweeted last year. “We already master usage of breathing apparatuses and can handle challenging situations.” Wong went on to coedit an issue of the literary magazine Deaf Poets Society called “Crips in Space” with writer and performer Sam de Leve. Or consider movement in space. You’ve certainly seen videos of astronauts zipping around the space station using their arms and legs to push off surfaces and direct their motion. This is a type of movement that people who use wheelchairs and other mobility aids are already familiar with. 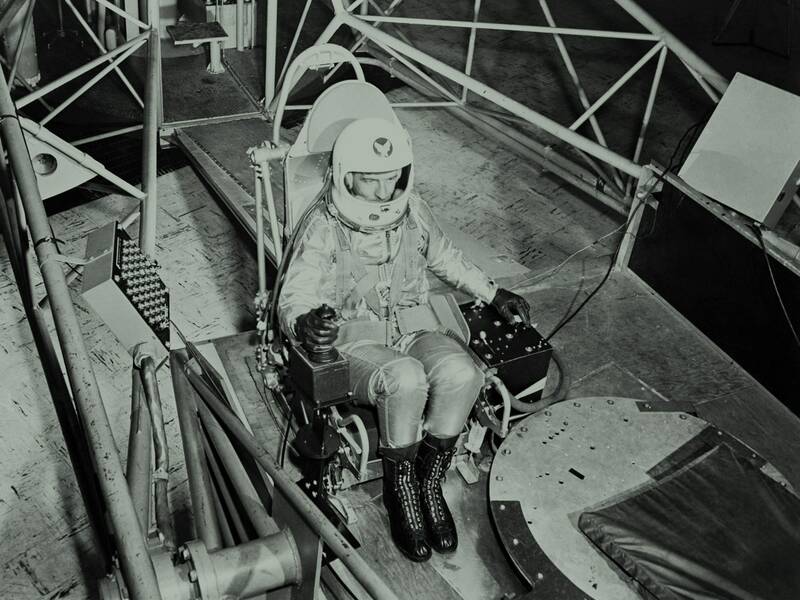 In fact, the various devices and ways of moving the body in space are likely more familiar to people with disabilities than to able-bodied people. “We move our bodies in so many different ways, and the disabled community has an exuberant amount of options,” says Nelson, who is an amputee and who has used crutches, a wheelchair, a scooter, and a prosthetic to get around. Nelson even coined a term for this recently: transmobility, the idea that there are lots of ways to get around besides putting one foot in front of the other. Nelson also points out that most astronauts have no prior experience relying on technology for their movement and lives, whereas people with disabilities do so every day. In a space suit, for a space walk, an astronaut has to be trained in how to move their body in unison with a piece of technology. They have to get used to the idea that, if that technology should fail, they could be in grave danger. This, again, is an experience people like Nelson live with every day. “I’m always moving my body in motion with another object. That’s all we do,” Nelson says. In the Mir fire that Wells-Jensen mentions, one of the problems that arose was the sighted astronauts’ inability to locate the fire extinguisher through the smoke. Had the ship been laid out with a blind participant in mind, there would have been a nonvisual signal already built in to such a critical piece of equipment. And it’s not just on a trip to space that people with disabilities might have an advantage. Take a situation in which astronauts are going somewhere to settle: Able bodies might no longer behave the way we expect. “Humans have an environmental niche on Earth, like all other creatures do, and we exploit it in different ways,” says Ashley Shew, a professor at Virginia Tech. Mars, or even a space station, is nothing like that niche. “The conditions in which our bodies have grown up are so drastically different that our existence in space will be much more like being a disabled person on Earth than like being an abled person on Earth.” Who better to send than those who are used to navigating environments not built for them—those who experience that every day on Earth? “Disabled people will fare better in space because disabled people have learned to negotiate hostile situations in ways that able bodied people are completely unaware of,” Shew says. Wong agrees. “The way we communicate, function, and exist with our diverse bodyminds sets us up as ideal space explorers and ambassadors of Earth, ready to make first contact with sentient beings,” she told me. Changing these requirements won’t be easy. Spacecraft are designed with certain assumptions about what kinds of bodies will be sitting in the seats and operating the controls. The opportunity to change those parameters is small and must be seized while ships are being designed, not down the road. Plus, many people with disabilities who might want to go to space can’t get access to the pipeline that delivers so many astronauts: “Astronauts come via the military and that’s a closed door for disabled individuals,” Myers says. “Those kinds of obstacles need to be removed for those individuals who are otherwise qualified.” And NASA itself has had no reason to rethink their stance, because no one has really pushed them to. Yet, that is. But all that could change. In 2017, Johanna Lucht became the first Deaf engineer to work at NASA. Eddie Ndopu, a South African activist and humanitarian, has said he wants to be the first disabled person in space. He plans to book a flight on a commercial trip into space and deliver an address to the UN while he’s up there. (MTV is slated to film the entire thing.) Julia Velasquez, a Deaf woman from California, has gone through many of the steps traditionally taken by astronauts—she’s interned at NASA, recently received her pilot’s license, and even lived in a simulated Mars colony in Hawaii. When I asked Myers if he ever wished he could have been an astronaut, he said, “Yes, absolutely. At one point I told Dr. Graybiel, ‘If you ever develop an experiment involving a flight into space, I want to be first in line.’” Myers likely won’t wind up in space in his lifetime. But he might live to see a disabled person make the journey, opening up space to a whole new set of uniquely qualified astronauts.